The mythology of the ancient Greeks reckoned there were only the summer, autumn and winter seasons. Summer held both the planting and harvest seasons and, with respect to the fields, had no greater representation than the goddess Demeter. At first, she probably had been a broadly construed earth goddess figure but later was associated more specifically with the harvest, the gifts of the earth, and with the warm golden glow of summertime. As the Greeks pondered the earth and the vegetative life it nurtured, they recognized that the seeds, biding their time below ground before coming to life above, were like the spirits of the dead, according to their beliefs. This association took mythological form in the marriage of Hades, Lord of the Underworld, to Demeter’s daughter, Persephone, who dwelt below ground with him in winter and returned to her mother above at the start of summer. She therefore encompassed the power of vegetative life to burst forth and then to withdraw into the soil again, and together with her harvest-mother, the two completed the full cycle of the agricultural seasons. Unlike the Greek system, the Roman calendar was comprised of our traditional four seasons, with the addition of spring. The history of the word “season” reaches back to Latin words relating to the sowing of crops, modified in medieval French to mean the time of sowing, the springtime. The Romans therefore had a more appropriate place to fit the myth of Persephone, or Proserpina as they called her, into their growing calendar, and she became directly related to springtime, being considered by Cicero as the metaphorical seed which led to all fruits of the earth. 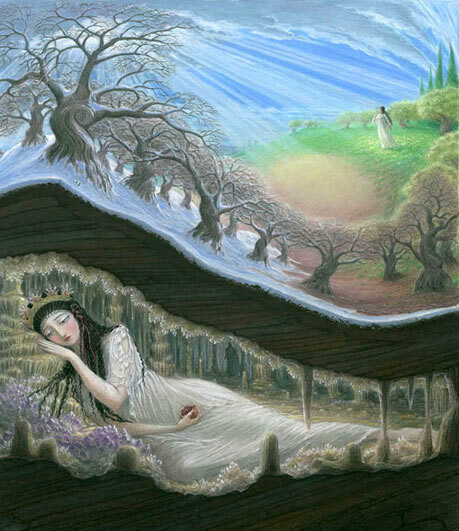 Despite this, however, the Romans also necessarily had to adjust the duration of Persephone’s residence underground, as four months now straddled two seasons. They resolved this by imposing an equal balance of six months in the worlds above and below the ground. An important understanding arose from this revision, if in fact it was not an actual reason for the revision upon which the Romans settled. Maurus Servius Honoratus, a late fourth century grammarian, commenting on Virgil’s Georgics poems, connected Proserpina’s six-month absence below the earth with the six months in total during the solar year when the moon is waning. This is an interesting contrast to her mother’s crucial connection with the sun. Where ripening crops relate primarily to light and heat and the solar forces, it seems Servius recognized that seeds relate more to water and to the lunar forces. He made this connection between seeds and the moon explicit. Servius explained Luna, their personified moon-goddess, and Diana, also a goddess of the moon, along with Proserpina as aspects of a trinity moon-goddess with their three corresponding spheres of influence―in the sky, on the earth and beneath it. Interestingly, this interpretation shifts the paradigm for growing/non-growing seasons from the solar sphere of Demeter (waxing/waning of solar power) to the lunar sphere of Persephone (waxing/waning of lunar power). Medieval Europe carried on the tradition that the moon rules over the seeds, imagining that they grew in the earth due to the dew which fell from the body of the moon, so that the fruits of the earth originated with the moon. These ancient traditions coincide with the beliefs and practices put forward by Maria Thun about the benefits of choosing seasonal “right times” for planting, both by the moon’s phases, as well as by the seasons of the solar year.